Because we know our customers use our nameplates to communicate identity to their customers, we ensure the highest levels of fit, finish, color accuracy, and appearance, hand- and computer-checking every part to precise specifications. 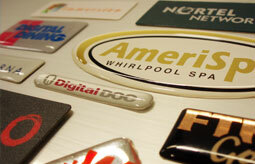 Our nameplates offer eye-catching logo reproductions and specialty effects such as embossing or debossing (hot or cold.) We use special materials, UV-cured finishes, and subsurface printing to enhance the appearance and extend the durability of your name.